Lesions of the skull base present a unique challenge to neurosurgeons. Special training is required to perform intricate surgery in the small recesses of the brain. Most skull base neurosurgical approaches require dexterity with surgical instrumentations, specifically bone removal instruments, through restricted corridors that contain vital structures. This aspect of surgery demands that surgeons be proficient not only with the tools but also with the complex anatomy to be negotiated. The development of a sense of the anatomic relationships between neural and vascular structures encased by bone is critical and requires practice. 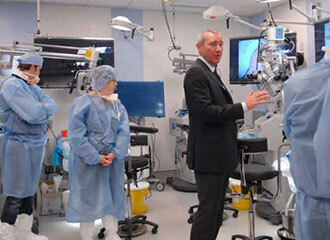 A cadaver dissection laboratory environment is the ideal training arena for neurosurgical residents and surgeons. In our Surgical Innovations Laboratory for Skull Base Microneurosurgery, trainees perform complex approaches to the cranial base on cadavers under conditions that simulate an actual operation as closely as possible. The laboratory is a state-of-the-art facility that integrates exquisite cadaveric dissections, 3D visualization, virtual reality, and computerized simulation for training of surgical procedures and visuospatial skills. We are currently offering the possibility of rotations/training at the Surgical Innovations Laboratory for Skull Base Microneurosurgery. The fellowship focuses attention on the training of neurosurgeons in the care of patients with pathology in the skull base region. The training is of variable duration from 3 to 12 months. This rotation/training is available to senior residents in neurosurgery or to neurosurgeons who have completed their residency training and would like to pursue specialized training in this area. The fellowship will consist of laboratory assignments. Laboratory activities will be directed by Dr. Antonio Bernardo, Director of the Surgical Innovations Laboratory. Activities in the laboratory will include a teaching role in the ongoing series of skull base and vascular neurosurgery courses offered to a national and international audience. The laboratory rotation will include independent cadaveric dissection to promote practice and rehearsal of complex approaches to the skull base. The dissection exercises emulate surgical approaches with abundant variations and modifications to the surgical procedures. The training will provide an exhaustive course to all approaches to the cranial base. The fellow will work closely with Dr. Bernardo for the purpose of education and for development of new neurosurgical techniques. It is expected that at least one or two publications will be completed during the training period, depending on the length of the training.